In Solution Explorer, right-click the Controllers folder and then select Add Controller. Name the controller StoreManagerController. Set the options for the Add Controller dialog as shown in the image below. 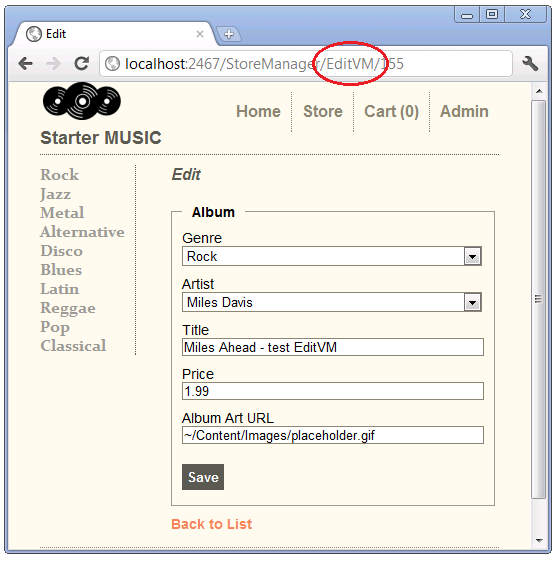 Edit the StoreManager\Index.cshtml view and remove AlbumArtUrl. Removing AlbumArtUrl will make the presentation more readable. The completed code is shown below. Open the Controllers\StoreManagerController.cs file and find the Index method. Add the OrderBy clause so the albums will be sorted by price. The complete code is shown below. Sorting by price will make it easier to test changes to the database. When you are testing the edit and create methods, you can use a low price so the saved data will appear first. Open the StoreManager\Edit.cshtml file. Add the following line just after the legend tag. The AlbumId is required to make changes to an album record. Press CTRL+F5 to run the application. Select to the Admin link, then select the Create New link to create a new album. Verify the album information was saved. Edit an album and verify the changes you made are persisted. The Albums table does not store the album genre and description, it stores a foreign key to the Genres table. The Genres table contains the genre name and description. Likewise, the Albums table doesn't contain the album artists name, but a foreign key to the Artists table. The Artists table contains the artist's name. If you examine the data in the Albums table, you can see each row contains a foreign key to the Genres table and a foreign key to the Artists table. The image below show some table data from the Albums table. The HTML <select> element (created by the HTML DropDownList helper) is used to display a complete list of values (such as the list of genres). For edit forms, when the current value is known, the select list can display the current value. We saw this previously when we set the selected value to Comedy. The select list is ideal for displaying category or foreign key data. The <select> element for the Genre foreign key displays the list of possible genre names, but when you save the form the Genre property is updated with the Genre foreign key value, not the displayed genre name. In the image below, the genre selected is Disco and the artist is Donna Summer. Open the Controllers\StoreManagerController.cs file and find the HTTP GET Create method. items: An IEnumerable containing the items in the list. In the example above, the list of genres returned by db.Genres. dataValueField: The name of the property in the IEnumerable list that contains the key value. In the example above, GenreId and ArtistId. dataTextField: The name of the property in the IEnumerable list that contains the information to display. In both the artists and genre table, the name field is used. 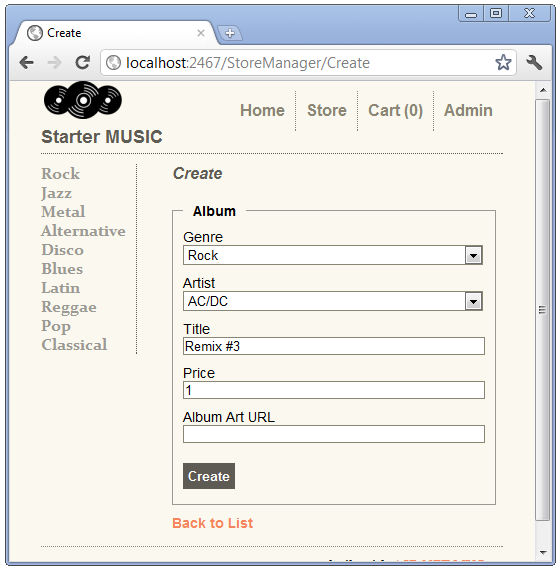 Open the Views\StoreManager\Create.cshtml file and examine the Html.DropDownList helper markup for the genre field. The first line shows that the create view takes an Album model. In the Create method shown above, no model was passed, so the view gets a null Album model. At this point we are creating a new album so we don't have any Album data for it. The select list would default to the first element, or Rock in our sample. Examining the HTTP POST Create method. 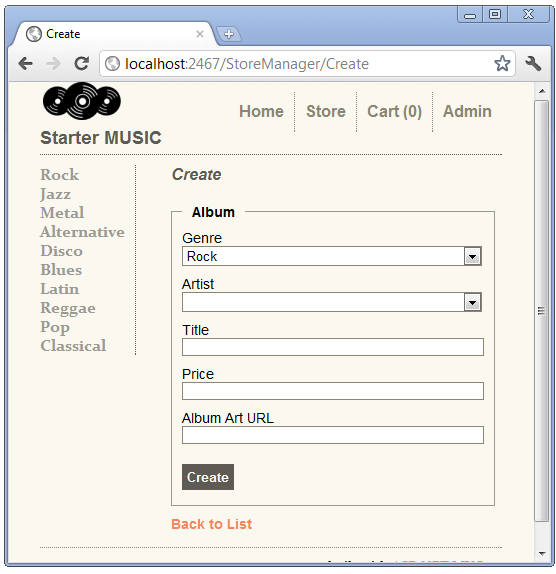 This overload of the Create method takes an album object, created by the ASP.NET MVC model binding system from the form values posted. When you submit a new album, if model state is valid and there are no database errors, the new album is added the database. The following image shows the creation of a new album. 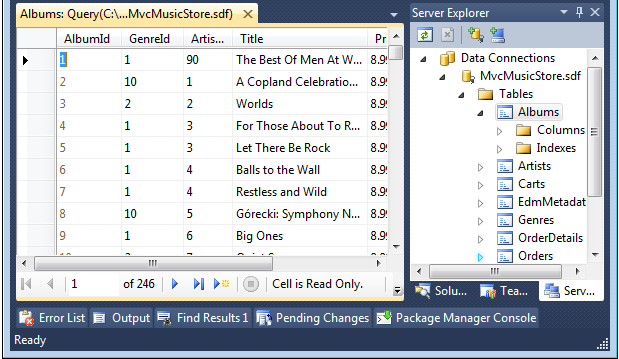 You can use the fiddler tool to examine the posted form values that ASP.NET MVC model binding uses to create the album object. Both the Edit methods and the HTTP POST Create method have identical code to set up the SelectList in the ViewBag. In the spirit of DRY, we will refactor this code. We'll make use of this refactored code later. 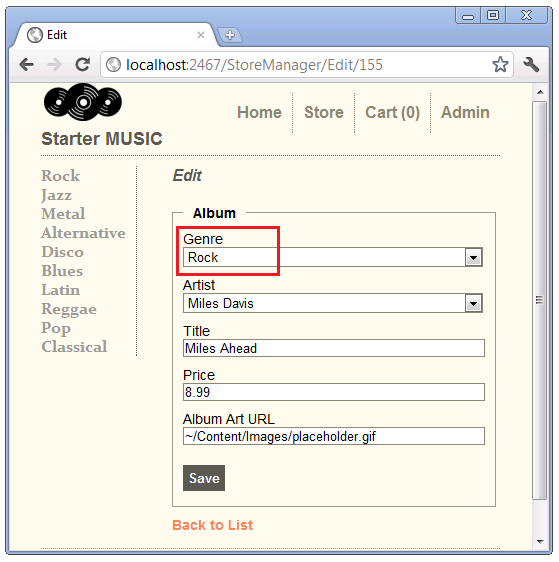 Create a new method to add a genre and artist SelectList to the ViewBag. Replace the two lines setting the ViewBag in each of the Create and Edit methods with a call to the SetGenreArtistViewBag method. The completed code is shown below. Create a new album and edit an album to verify the changes work. string name,         // The name of the ViewModel property to bind. // typically  String.Empty or "Select a Genre"
The DropDownList markup for the create view is shown below. Because the ViewBag property for the SelectList is named GenreId, the DropDownList helper will use the GenreIdSelectList in the ViewBag. In the following DropDownList overload, the SelectList is explicitly passed in. string name,            // The name of the ViewModel property to bind. Run the application and click the Admin link, then navigate to a Jazz album and select the Edit link. Instead of showing Jazz as the currently selected genre, Rock is displayed. When the string argument (the property to bind) and the SelectList object have the same name, the selected value is not used. When there is no selected value provided, browsers default to the first element in the SelectList(which is Rock in the example above). This is a known limitation of the DropDownList helper. The names Genres and Artists are better names for the categories, as they contain more than just the ID of each category. The refactoring we did earlier paid off. Instead of changing the ViewBag in four methods, our changes were isolated to the SetGenreArtistViewBag method. The Create view requires an empty string to prevent the first item in the SelectList from being displayed. Create a new album and edit an album to verify the changes work. Test the edit code by selecting an album with a genre other than Rock. 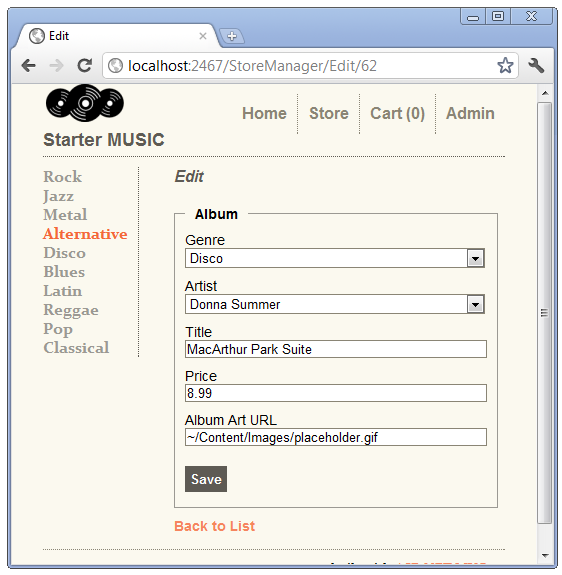 The AlbumSelectListViewModel constructor takes an album, a list of artists and genres and creates an object containing the album and a SelectList for genres and artists. 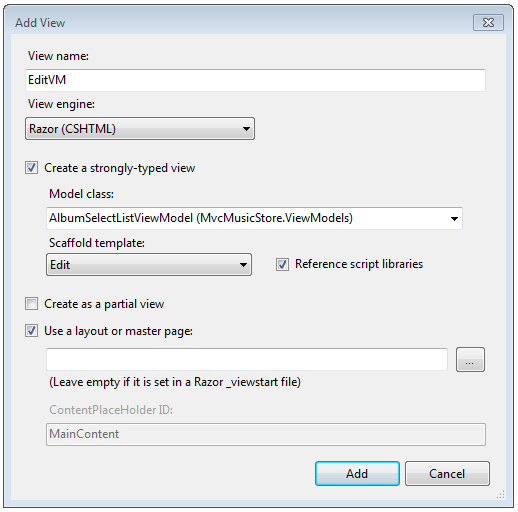 Build the project so the AlbumSelectListViewModel is available when we create a view in the next step. Add an EditVM method to the StoreManagerController. The completed code is shown below. 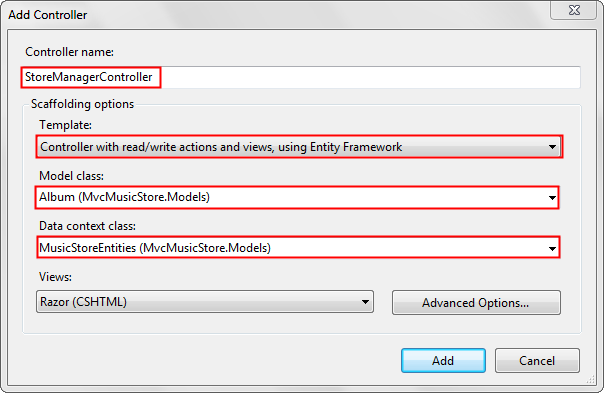 Right click AlbumSelectListViewModel, select Resolve, then using MvcMusicStore.ViewModels;. Right click EditVM and select Add View. Use the options shown below. The EditVM markup is very similar to the original Edit markup with the following exceptions. Model properties in the Edit view are of the form model.property(for example, model.Title ). Model properties in the EditVm view are of the form model.Album.property(for example, model.Album.Title). That's because the EditVM view is passed a container for an Album, not an Album as in the Edit view. The DropDownList second parameter comes from the view model, not the ViewBag. The BeginForm helper in the EditVM view explicitly posts back to the Edit action method. By posting back to the Edit action, we don't have to write an HTTP POST EditVM action and can reuse the HTTP POST Edit action. Run the application and edit an album. Change the URL to use EditVM. Change a field and hit the Save button to verify the code is working. All three approaches shown are acceptable. Many developers prefer to explicitly pass the SelectList to the DropDownList using the ViewBag. This approach has the added advantage of giving you the flexibility of using a more appropriate name for the collection. The one caveat is you cannot name the ViewBag SelectList object the same name as the model property. Some developers prefer the ViewModel approach. Others consider the more verbose markup and generated HTML of the ViewModel approach a disadvantage. In this section we have learned three approaches to using the DropDownList with category data. In the next section, we'll show how to add a new category.